Ukraine should amend domestic law on use of firearms by law enforcement officials to comply with international law and standards. Police use of a firearm should only be lawful where necessary to confront an imminent threat of death or serious injury or a grave and proximate threat to life. Article 27 of the 1991 Constitution of Ukraine guarantees everyone the "inalienable right to life". The state has a duty to protect life. Article 28 prohibits torture, or other forms of cruel, inhuman or degrading treatment or punishment. Article 39 provides that citizens have a right to attend peacefully, without a weapon, and to hold meetings and demonstrations, where the organs of executive power or of local self-government are notified in advance. Article 17 refers to the law enforcement authorities of the state, whose organization and activities are "determined by law". According to Ukraine, the National Police "was re-established in 2015 based on the new principles of accountability, transparency, professionalism and respect for human rights". 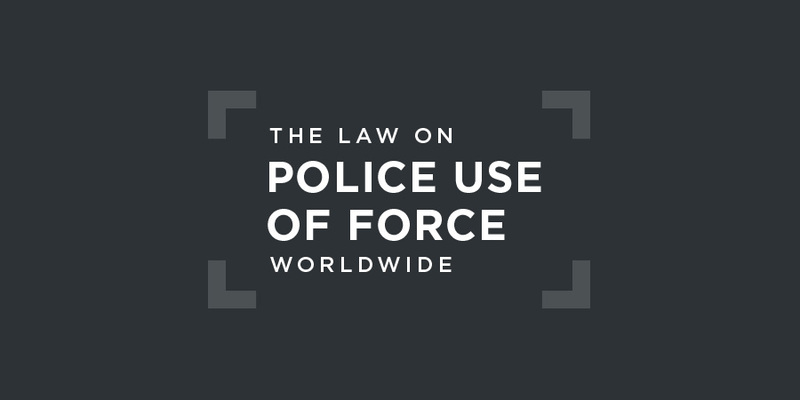 The 2015 Law of Ukraine on the National Police governs the use of force, stipulating that a "selected police measure shall be legitimate, necessary, proportionate and efficient". c) stopping massive or group public disorders. b) stopping massive or group public disorders. b) repulsing the attack of an animal which threatens life and health of the police officer and other people. 7) to stop a vehicle through damage to such vehicle, if the driver’s action threaten life and health of people and/or police. In late 2018, Ukraine formally established an independent police complaints mechanism, the State Bureau of Investigation. Although Ukraine is not a state party to the ICC, in 2014 it deposited a declaration giving the Court jurisdiction over alleged crimes against humanity committed in the context of the "Maidan" protests which took place in Kyiv and other regions of Ukraine between 21 November 2013 and 22 February 2014, including murder; torture and/or other inhumane acts. The jurisdiction was subsequently expanded to cover both the situation in Crimea and eastern Ukraine. In late 2018, the Office of the Prosecutor of the ICC declared that it expected to finalise its analysis of subject matter jurisdiction in relation to both the situation in Crimea and eastern Ukraine "in the near future". at allegations of excessive use of force by government special and riot police and other personnel, in connection with the popular protests throughout Ukraine, and in particular in the dispersal of protesters in Kyiv on 30 November 2013, as well as events in December 2013 and the reported killings of protesters between 19 and 21 January 2014 and 18 and 20 February 2014. The incidents in February 2014 were accompanied by so-called sniper killings by unknown assailants and other injuries of protesters, as well as of police and law enforcement officers. at other crimes reportedly committed by law enforcement officers during the Maidan protests, including alleged beatings of medical staff seeking to attend the wounded. Events in Odessa (2 May 2014) and Mariupol (9 May 2014) have also evoked concern over the loss of life and allegations of excessive use of force. In his 2016 report on a mission to Ukraine, the Special Rapporteur on extrajudicial, summary or arbitrary executions similarly noted that, in December 2013 to February 2014, 123 people had lost their lives as a result of violence during the protests in Maidan Square in Kyiv, including 106 persons — most of them protesters — and 17 officers of the internal affairs/police. He raised concerns that at least 77 persons had been killed as a result of the firing of live ammunition, allegedly by special police force and other law enforcement officers. This case concerned the alleged enforced disappearance and unlawful police killijng of the applicant’s son, V.K., who had a long history of chronic alcoholism and opium addiction. On 13 August 2003, V.K. left home and never returned. On 22 August 2003 V.K. left hospital without authorisation. Shortly after midnight on 25 August 2003 he was found injured and unconscious at Fastiv railway station. Several people who had been detained in the police unit at Fastiv railway station on the evening of 22 August 2003 stated that they had witnessed the following events. At about 8 p.m. two police officers had brought in an apparently drunk man (subsequently recognised as V.K.) and placed him in a cell. As V.K. had protested loudly against his detention, one of the officers, who already was at the police station when V.K. had arrived, entered his cell and hit him in the face with a rubber truncheon. V.K. had fallen down and his nose had started bleeding. K.M. had then kicked him twice, on the head and torso. The two officers who had apprehended V.K. joined officer K.M. From that moment the other inmates chose not to watch the beating but heard it going on. At about 6 a.m. on 23 August 2003, after the other detainees had been taken out for various procedural acts, V.K. had remained in the police unit, lying motionless on the floor. By noon that day he was no longer seen there. In its judgment, the European Court of Human Rights noted that not all of the applicant’s allegations were sufficiently corroborated. The Court, though, that it has been established that the applicant’s son died as a result of the force applied to him by the police during his unacknowledged detention. His resistance to the police was limited to verbal expressions of dissatisfaction about being detained. That was, however, enough to provoke officer K.M. to enter the cell and hit V.K. in the face with a rubber truncheon, breaking his nose and causing him to collapse. Although the applicant’s son was lying helpless on the floor, with a bleeding nose, two other police officers joined in beating him, which continued for an unspecified period of time. As eventually established by the domestic investigation, he sustained at least eight blows to the face and head. the utter arbitrariness of the police officers’ actions and their unwarranted violence against V.K. It notes that a year and a half before the incident, in February 2002, he had already complained to the prosecution authorities of continued physical ill-treatment and psychological pressure from officers at the Fastiv railway station police unit.... Their behaviour in August 2003 suggests that his complaint had not received due attention and that they had nothing to fear. The Court concluded that V.K. had received fatal injuries while being at the hands of the police.